I’ve always thought that there are no good or bad coaches but coaches who are brave and coaches who aren’t. Coming off one of its poorer performances of the Guardiola era in the loss against Getafe, Barça returned to Camp Nou to face Rayo Vallecano. The match was described as a “test” by many. That particular description seemed tenuous given the team’s rich vein of success over the past three seasons. With that recent history one match versus any squad is exactly that – one match – not an assessment of their aptitude or character. Nonetheless, given the importance of not falling behind anyfurther in the table, and perhaps even more critically – the need to get back towards playing at the level they are capable of – the match was one of note, an opportunity to edge back closer to optimal form prior to the Clasico. To date, Barcelona’s season has had a jagged, unsettled quality to it. Factors such as recurrent injuries have prevented the team from achieving consistency not only in results, but in the quality of their play. Interestingly, for a team that has the level of accomplishment that Barça do, it has been a team searching for an identity this season. Or rather it’s been a team that seems to be exploring a number of new identities, and is still in the process of defining what it will be. For many, Barcelona this season has been a team in flux and it is this incessant change which has been the drivers for these inconsistencies. Changing tactical systems and squad rotation are argued to be preventing the team from achieving consistency. In exploring identities they’ve become protean. From this point of view, what Barcelona need to do, particularly prior to the Clasico, is to urgently define their model. Pick a line up and a system and play it so that the team can cohere. However, it’s often easy to confuse symptom for cause. An alternative hypothesis is also important to consider. Perhaps the team isn’t playing as well as last season because it hasn’t changed enough. That other teams, constantly trying to catch up and evolve ways of diminishing the blaugrana’s edge, have gained insight into how to stop their model. From this perspective the problem isn’t that the team is changing too much – but hasn’t changed enough. It has perhaps become a bit too homogenous and one note in its style. During the Spanish Super Cup that started this season, Madrid came out and made a statement – not only were they prepared to play Barcelona, but they had evolved themselves as a system. They were going to try to play in a very different way and create new challenges. At that point, Barcelona really had a choice – double down and look to maintain your system for the season as it functioned last season – or explore new modes of play. These are the kind of choices we face all of the time. You can build a fortress. Or you can learn how to run. Or you can go through the difficult process of trying to build something that’s in between, something uncertain, even ambiguous, something that’s agile yet sturdy. Something that feels like home, at least for now. The increased competition and challenges were always inevitable for this Barcelona project. Other teams were never going to sit on their hands and watch Barcelona dominate. That’s the history of football. And this is why Guardiola is always looking to push his side, to acquire different weapons even when the fit may not be readily apparent. This was the impulse behind playing a 169 cm player as a central striker for the first time during a trip to the Bernabeau and then playing him there again in the Champions League final against Manchester United. It’s this same impulse that led to spending 70m on a 195 cm striker from Serie A. But it’s that same impulse that led to trusting a skinny kid few had heard of as a holding midfield in place of Yaya or trusting a player who had never played CB to take the spot of Puyol at the back. The same spirit, the same intellect drives all of these kinds of change. Isaiah Berlin famously categorized great thinkers as hedgehogs and foxes. Hedgehogs know one big thing; they know it deeply and that guides them. Foxes know many things. Doestoevsky was a hedgehog. Checkhov a fox. What made Tolstoy so great according to Berlin was that he was by nature a hedgehog but in practice a fox and the two sides of him were constantly struggling, burning with creative tension. Berlin didn’t mean this to be rigid. People are almost always a mixture of both hedgehog and fox. It’s more a way of thinking about thinking. When we think of total football – and of its modern interpretation in tiki-taka, it’s hedgehogs that come to mind. Cruyff and his stringency is perhaps football’s quintessential hedgehog. Today, Xavi may also be described that way. Uncompromising. Stringent. There’s a way to play football at its highest level – and one must strive diligently to play according to those principles. Indeed, individuals who see football as a system often have a similar point of view. Arigo Sacchi was one of football’s great hedgehogs. After defeating Manchester United to win his second Champions League Trophy as a manager, Guardiola said of the match, “The way we won is what I’m most proud of – this is how I want to play football.” Like Cruyff and Xavi, Guardiola is often considered a classic hedgehog. But he’s not. He’s much more fox than he seems at first. Guardiola was part of one of the great sides in the history of the game as a player – and he watched not only as that team’s cycle ended but watched as the entire club itself took step backwards as that era closed. Inspired by Cruyff, the Dream Team was more of a hedgehog team. It was Crime and Punishment. The Idiot. The Brother’s Karamazov. And for a while, Pep may have felt at home in that language. Radical and uncompromising. But that can be a very hard way to live. Or at the least, a hard way to survive. So as a manager he’s been creating a side – and an organizational model – that is far more supple and divergent than it may seem at face. If you sat down with him and private and talked to him I’d guess that he would admit that there are many ways of being brave. That a manger’s responsibility is understanding what a group of players needs to find to in order to best believe in themselves. So headed into a match like the Rayo Vallecano match – a match in which many were saying Barça needed stability, needed to get back to their model, what did Guardiola do? The exact opposite. He went full force forward into experimentation and engineered one of the most creative and messy approaches to a match that his tenure as manager has seen. And in the process of figuring things out, in the process of exploring identities, he crafted a way of putting his players in a position not only to win, but to dominate and do so after an opening in which they were on their back heels at Camp Nou. Against Rayo, Barcelona played one of the more interesting tactical matches the Guardiola era has seen. What made a seemingly comfortable performance against a mid-table team of such note? Barcelona evolved how they played through three different systems during the match and did so using the same set of players. In addition, the match turned dramatically when Barça settled into a system they had rarely utilized under Guardiola. Dominance was produced by coupling talent and skills with novelty and innovation. This match passed through three distinct phases. In the first phase, Barcelona played their base 4-3-3 and Rayo Vallecano was able to press very effectively high up the pitch. The key to Rayo being able to do defend this way and do so as well as they did was the manner in which they overloaded midfield. Rayo was one of the first teams to effectively acknowledge that Barcelona don’t play a true striker and defended as such. This phase of the match lasted for roughly the first 11 minutes of the match. In the second phase, Barcelona changed systems from a 4-3-3 to a 3-4-3. This phase roughly went from minutes 11 to 28 of the Dani Alves stopped playing RB and was moved to a right sided midfield position. Alves played very similar to the position Thiago has when Barcelona play a 3-4-3 with a lopsided midfield diamond. During this phase Barcelona started playing a three man backline with Pique as the sweeper, Abidal the left center back and Mascherano sliding over laterally to a right center back position. While this formation helped Barça maintain possession better when faced with the Rayo pressure, it didn’t allow them to create penetration. In the third phase of the match, Barça reconfigured their system again, changing to a 3-5-2. Sanchez moved from the advanced right forward to left flank winger. Alves moved from midfielder to a right winger. Villa pinched in from the left wing centrally and played in the most advanced attacking role, with Messi just behind him playing a free role in the two man striker formation. And once Barça moved to this formation the entire match changed. Barcelona went from a stuttering performance to an electric one where they simply overwhelmed the opponent. With Afellay the club’s only player missing from injury, Guardiola had at his disposal the most fit squad he’s had for some time. And he started close to what appears to be evolving into this first choice line up: Valdez-Alves-Mascherano-Pique-Abidal-Keita-Xavi-Iniesta-Sanchez-Messi-Villa. Busquets was rested again and was the only first choice starter not fielded. This match demonstrated the range of talents and the flexibility this squad provides Guardiola. One of the most remarkable aspects to the match was that Barcelona was able to move through three very different systems – and do so without any substitutions. In general, to move from one system to another requires substitutions to be made. To move from one system to a second to a third would require multiple substitutions. However, Barça were able to play in very different arrangements by simply shuffling the starting line up into new configurations. This allowed Pep to experiment, to try out a style of play in response to how Rayo was playing to see if it would work without committing to removing a player and potentially wasting a substitution. The opening of the match saw Rayo pressuring the ball very high up the pitch and doing so effectively. Again, the competition and their strategy has evolved. It is now common to see teams look to press Barça high up the pitch. This is something we saw far less frequently in 2008/09. Then teams wouldn’t think of it as they were afraid of getting beat and outnumbered deep. But over time, teams have decided that the risks of allowing Barcelona to systematically build out from the back and develop rhythm to their passing game is greater than the risk of Barcelona beating them through fast transition play while they are defending high. Rayo is pressing very high up the pitch. But the key things to notice is at the backline and midfield. Rayo has five defenders in midfield. They have numerical advantage 5 vs. 4 even with Messi dropping deep. In addition, notice how there are no central defenders at the back in the middle of the pitch. The area has been vacated. Barcelona’s response above was the right one. They spread the full backs and wingers very wide to make the pitch large through width. However, by moving four players so wide, Barça had more difficulty building play through the middle and were “losing” the battle there. Since moving Messi to the false 9 Barça has again and again derived an advantage from the way the opposition has defended. In general, teams have wanted to keep their CB stationed where CB traditionally are – deep and central. But this means that when Messi or Fabregas or even Villa drop deep they can go unmarked between the lines or in midfield. Rayo’s gameplan was to prevent this. Rayo used a system of zonal coverage with man marking. They were willing to vacate the center backline in order to overplay the midfield. The deepest defenders are the full backs who are deep to check the Barcelona wingers Villa and Sanchez. By allowing their defenders to defend in a mobile fashion Rayo was able to place an extra defender in midfield. This is why their pressure was so effective and why Barça had so much difficulty getting the ball out of its own half. As Valdez or the defenders looked to play the ball midfield was overplayed by defenders. This often forced Barça to try to play the ball long – which they just aren’t good at. In turn the team lost possession far more frequently than they are use to. The image above is worth remembering. We may see it again in the coming Clasico. The manner Rayo defended had a number of similarities to the system of defending Real Madrid have adopted (and what we saw in the Spanish Super Cup). Rayo clearly doesn’t have the talent or athleticism Madrid have. But in principle, the two systems share common principles. Pressure high while overloading midfield to prevent Barça from building up of play. After ten minutes or so Guardiola had seen enough and reconfigured Barcelona’s system. Dani Alves was pulled off the RB position and played as a right sided midfielder. Now Alves often playes a fluid role – but in this game he was clearly moved to midfield with Barça changing to a three man backline. Compare Alves’s position to the first image. Alves has tucked into centrally to midfield which is now roughly diamond shaped – Keita at the base, Xavi at the tip, Iniesta left and Alves right. At the back Barça have three defenders (in the shot above Abidal is pressing and as such not level with Mascherano/ Pique). Moving Alves to midfield allowed Barcelona to regain numerical advantage in midfield. Alves acted as an extra man in midfield. This allowed him to act as an open outlet in the region of the pitch that had been most problematic for Barça earlier due to Rayo’s defensive scheme. Notice above how wide open Alves is. Rayo didn’t have a defender available to mark Alves in midfield. This left him open often and Alves quickly became Barcelona’s most dangerous player making decisive runs forward and putting a very dangerous shot on goal after breaking free in midfield. Part of why Barcelona could comfortably play this system was that Rayo was playing a 4-4-2. Against a two striker formation, Barcelona could play three at the back and still have a free defender to support. However, while moving Alves to midfield facilitated possession, Barça still wasn’t able to create enough penetration to create danger. Build up still went through the middle, the region Rayo was still most focused on. The game changed dramatically once Barcelona switched to their third formation – a 3-5-2. The team played with much more fluidity and dynamism all around. And suddenly after a 28 minutes of struggling, Barça scored three goals in 15 minutes. Above, Notice how deep Sanchez has dropped. He and Alves are spread wide and given license to move up and down the entire flanks. Barça is playing two strikers up top, as Villa has pulled in centrally to join with Messi. One of the issues that Barça has on their left flank is that the left winger can become isolated. On the right, the right winger can be supported by Alves. The left backs are generally more conservative. Moving Sanchez to the left winger position game Barça a player with qualities similar to Alves. Sanchez has the pace, explosion and work rate to man an entire flank by himself. By splitting up Sanchez and Alves, Guardiola put two athletic, players with pace in wide positions. This destabilized the entire way Rayo was trying to defend. The focus of Rayo’s defensive scheme was to control the center of the pitch. Now Barça not only had width – but dynamic width on both sides of the pitch. In the 4-3-3 Barça ’s frontline wide players occupy the most constrained roles in the system. They aren’t given that much freedom. Their job is to stay wide and advanced, creating tactical width. In the 3-5-2 the wide attackers gained more freedom and space to operate in. Due to their pace and aggressiveness towards goal Sanchez and Alves gave Barça attacking thrust on both flanks while still being able to cover space defensively behind them (modern 4-4-2 can be very problematic for a 3-5-2). Often it gave Barcelona four frontline attackers. Rayo had significant difficulty adjusting to this change of formation. The key disruptive force was Alexis Sanchez, who destabilized the left flank. Moving Sanchez to the left overloaded Rayo’s defense because Villa moved left-center and drew two markers and Messi continued to draw two markers as well while Alves stayed wide. Alves and Sanchez wing play was well demonstrated in Sanchez’s first goal. Notice Messi and Alves’ positioning. Messi has dropped deep right while Alves is in advance of him. In otherwords, Messi has dropped into the space that Alves would usually be occupying in the Barça 4-3-3. Messi runs at the defense. Notice the large gap between the Rayo CB. This is due to the positioning of Villa left of center while Alves is very wide right. Because Rayo wanted two men marking the central striker Villa, Sanchez is left unmarked wide left. Messi beats his man and draws a second defender. The Rayo defense reacts by closing space on Villa to try to prevent the through ball via the middle that Messi loves to play. Instead Messi passes to a wide open Xavi. Sanchez is now all alone because while he’s drifted in he’s stayed wide outside of the Rayo right back. Sanchez does well to hold his run and not drift offside. Xavi plays a very simple pass to the open Sanchez. Now while Sanchez is open in space a goal from that angle is by no means a sure thing. The keeper can close down the angle to the near post easily leaving the wide player with no angle to shoot. Sanchez though demonstrates wonderful ball skills and quick feet, cutting the ball back to his right foot, using the onrushing defenders momentum against him. He then curls in a beautiful curl to the far post between two defenders. That is exactly the kind of goal scoring Barça has been missing this season. A source outside of Messi who can beat a player and finish with finesse and calm. Sanchez was Barça ’s major purchase over the summer. A young player not necessarily considered a superstar across the world, his purchase seemed to come out of nowhere to many. However, Sanchez was arguably the single best player in Serie A. The major question with Sanchez was how would he adjust from playing as a dominant trequarista last season to a wide player for Barça . In particular, how would Sanchez’s finishing around goal develop? What was so encouraging about the match yesterday was the calm and finesse Sanchez displayed around goal. His first score was simply brilliant. It immediately brought to mind the kind of lovely, curling finishes that are David Villa’s hallmark at his best. While the second score was more direct it was built off a broken play and would have been easy to get under or shank as it was bouncing. Also, he never stopped tracking forward towards goal which was why he was in position to finish the play. Many supporters were criticizing Sanchez, wondering why he was purchased. Yesterday started to demonstrate why Guaridiola targeted him as a player who could expand how Barcelona can play. David Villa has obviously been having a very difficult time on and off the pitch recently. The Rayo match was one of his best of the season. Not perfect – but a real step towards the form Barça needs from him. Villa looked much more fluid and dangerous in his role as the advanced striker in the 3-5-2. The issue wasn’t only him playing centrally, but of him having more freedom than he does when he’s asked to play wide. Now, whether it Villa is the right player to play centrally against a team that sits deep and defends in numbers like Getafe did is a separate question. But against Rayo he played very well. This is important because during this season, Villa has in fact not only struggled against teams that defend deep and in numbers, but also against teams that play a high back line. Against a high back line Villa is moved away from goal and isn’t able to utilize his finishing skills. Yesterday against a team that plays high Villa had his best game in weeks. Not only did Villa score but his movement, particularly around the box was very strong and opened up opportunities. His interplay with Messi worked very well – rather than getting in each other’s spaces both Messi and Villa had room to work as their were only two only two of them flanked by wide players. Hopefully this match gets Villa back on track. While the 3-5-2 has many advantages – 3 man midfield, wide players, two man striker formation. It comes with a real cost. It can become very complicated defending at the back. It requires enormous work and effort from the wing backs and coordination between defenders (backline, wing backs and holding midfielder in particular). It was interesting to see how well Barcelona did these things in the new system. In the shot above, Ray has played the ball quickly out to the left flank behind Alves. This is one of the issues with the 3-5-2. It’s also why it’s so important to have lateral center backs with pace and strong positional sense – they have to cover enormous space. Mascherano quickly moves to close out the player behind Alves. When Mascherano moves out to the flanks however, Barça can be caught short at the back. Keita however, seeing Mascherano move wide, drops deep to the middle to act as the new CB with Pique moving rightwards to fill space with Mascherano. Watching this match for a second time – it seemed to me that Barça ’s coordination and movement were so on the mark that Guardiola has likely been drilling them to play this formation in practice for sometime. I can’t say for sure – just a guess. The ability 10 players to start a game playing one system to then seamlessly morph into an entirely different system was well demonstrated on the fourth goal. Rayo has the ball along the right flank. Alves is defending the ball wide and a Rayo attacker moves laterally into the space a RB usually occupies. Mascherano follows him – notice the space that’s opened up between Mascherano and Pique. This is the kind of situation where a three man backline can easily get dragged out of shape. The key intervention to prevent this is Sanchez’s positioning. He’s dropped all the way back to the front line to act as a fourth defender deep, occupying a position similar to where a left back would be playing. ally. Sanchez dispossess the ball and then holds the ball by dribbling as three Rayo players look to repossess the ball. Sanchez plays the ball to Mascherano. Rather than playing a short pass to Xavi he plays a long pass to a single marked Messi. With one touch Messi flicks the ball wide to Alves. All Messi needs is to get a foot on the ball because Alves is completely open in space wide. Notice how fast the transition play is here. Alves started the play defending. He’s now quickly moved into space to attack. The Rayo midfielder is forced to move wide to close down Alves. At the same time Villa makes a driving run towards goal to occupy two defenders. Both center backs have to follow Villa because Sanchez, through his pace, has caught back up to the play even though he was the one who started it deep in his own end by dispossessing the ball. Because these two Barcelona attackers are occupying three Ray defenders while Alves is occupying a Rayo midfielder wide, Messi is left 1 vs. 1 with the full back. Almost no defender can contain Messi 1 vs. 1 in space and Messi easily accelerates around the full back. What’s so interesting about the shot above is how two Rayo defenders continue to mark Villa in the center. Villa has continued his driving run and the markers felt the need to stick with him rather than close down the ball. This may be sub-optimal defending – but out on the pitch at speed – these aren’t simple decision to make. Team: Strong performance. Really changed their level of play when they opened up the pitch in the 3-5-2. Guardiola: Terrific in game adjustments. Had his team ready to play. Valdes: Rayo put significant pressure on him to play the ball out from the back. VV is going to have to adjust to these strategies as he will see them more frequently. Almost caught flat footed on a curling shot in the first half he was originally thinking would go over the bar but dipped goal wards. Not good to see, especially after he let the ball roll out of bounds for a corner against Getafe. Made a strong save in the second half. Mascherano: Another masterful performance. Against Valencia earlier this season he struggled greatly as a right center back. Against Rayo he excelled, covering enormous amount of space on the right – which was the area Rayo tried to attack behind Alves. Pique: Assured at the back defensively. Beautiful run into space as Barça spread the defense open to set up that third goal. Abidal: Another terrific performance. Like Mascherano his pace and positioning out in space were terrific, especially early in the match. Alves: Strong performance. Yes his passing could have been more accurate. However due to the Rayo pressure all of the Barça passing was off (Xavi completed “only” 83% of his passes for comparison – much lower than his usual). And the big picture was that Dani’s skill set and flexibility were instrumental in allowing Pep to run three different systems until he found one that worked. Keita: Terrific in midfield. Played a very fluid role and did so well. One adjustment Keita needs to make – his tendency is still to often shade towards the left. When he’s a DM however, he needs to be aware that teams look to attack behind Alves – often because they think of Alves as an out of position full back rather than as a wing back or midfielder. Iniesta: Looked very lively and dangerous. When the pitch opened up in the 3-5-2 he really grew into the game. Good to have him back. Xavi: Against Getafe Xavi attempted 123 passes in 90 minutes, completing 92%. Against Rayo he played 54 minutes and only attempted 30 passes – completing them at a 83% accuracy. That speaks to how much Rayo was looking to overplay the middle and stop the Barça attack. The team’s creativity was more distributed this match – and they were much better off for it. Sanchez: Brilliant performance. Demonstrated his game changing ability on the ball and deft finishing. His work rate and defending are phenomenal. Man of the match. Messi: Really excelled playing off Villa in the 3-5-2. The extra open space that developed augmented the danger he brings to the match. Sort of lovely to see him playing that way – the contemporary 3-5-2 was a formation first invented by Carlos Bilardo at Estudiantes. The formation became known world round during the 1986 World Cup. It was the system Argentina utilized and the reason why Bilardo adopted it was that it provided a platform for Maradona. In another touch point in history – here was Messi playing not only the same way – but in a similar position to the one Maradona did. This match was sort of the tactical version of Messi’s famous goal against Getafe. Villa: Thought he had his best game in weeks. He really needed to score and he did. Sure that’s a relief. But more than that – he was much more involved and active in overall game play. Not just a tactical piece staying wide – but a dynamic force shaping the match. Had two opportunities to score in the second half. Would have been good to see him convert at least one of the two. But this was a positive – keep moving forward. Fabregas: Still growing into the team. When he and Thiago entered the match Barça lost some sharpness in possession and attack. By the time they entered the outcome was decided – but nonetheless, didn’t dictate midfield play. He’s been his best in a free role for Barça rather than when he’s been asked to play as a more traditional midfielder in Xavi or Iniesta’s spot. Did create a terrific scoring opportunity for Villa. Thiago: Easily the most accurate passer on the team for the match at 91%. However, he gave the ball away a few times in non-passing situations. Neither he nor Fabregas controlled the match in midfield. Adriano: Good to see him back. Unfortunately, he’s now injured his hamstring again. Perhaps he came back too early? A welcome match – not only for the result but for how Guardiola orchestrated the match and how the team responded to the way he had them change play. People may want Barça to go back to a stable system with a set line up. But it seems like Guardiola’s treatment calls for more variation and change rather than moving back towards prior modes of play. Previous Post That’s My Team. It’s an adjustment Keita will need to make as a DM. He’s used to playing on the left – that’s his strong side and the side he’s used to. But teams often attempt to attack Barca’s right flank. They often see Alves so high up the pitch they look to get the ball behind him. It’s just something he’s going to have to stay aware of. I thought he actually got better about that in this match itself. He read the direction of the attacks and adjusted appropriately. What an eye opening review Euler. Keep them coming bro! Looking at Alves diffenrent roles throughout the match, could we say that Pep has introduced false right back or false right winger position for Alves. By default, every team will consider Alves is RB, whenever he stay way up front, it means he’s out of position. But now, it’s adding element of surprise from Pep by using Alves variously. I’m sorry Euler I can’t hear you over the sound of my mind still exploding over your review. Could you repeat that for me again? Pep was the Man of the match imo. But yeah, Sanchez totally deserves it. I mean, outshining Messi is a outstanding feat. Spot on with the analysis, Euler! Love the snapshot (Sanchez Drops to LB Position When Alves Defends High on Right) which shows a part of what Barca brings to the beautiful game. Such distribution of players! I observed that Iniesta seems to be looking to shoot more often this season. I believe he is our key solution against teams like getafe with his close control and shots from outside the box. And the 3-5-2 worked so wonderfully, that it gives brave coaches like Unai Emery and Bielsa so much more to think about. After seeing this match, I really cant see us lose the league. But this season would go down to the wire, I’m afraid. Great tactical analysis! I was hoping for a little more detail on exactly why Fabregas and Thiago didn’t control the midfield as well as Xaviniesta/ what they can do to improve their game. An EE troll just tried to read this review and his head literally exploded. Great Eulergy. Most important of all is the premise. With the entire soccer world disecting our style of play, the best best defense is…many different offenses. If Pep can install that discipline (certainly we have the player talent), what will be a powerful addition to our force. And if it allows Villa, Sanchez, and Messi to play together collaboratively, then it may be my new favorite. Waaay too early to give up on Villa as some have stated. Is Puyol mobile enough to play back in this formation? I could see Fabregas chipping balls over the top to all 3 of those forwards for endless goalscoring fun. first of all of course, thank you, Euler. I would be impossible for me to understand about their transformation during the match from 4-3-3 to 3-4-3 and finally 3-5-2.
that is something my “tactically-blind” eyes cannot see without your explanation. a match in which many were saying Barça needed stability, needed to get back to their model, what did Guardiola do? The exact opposite. like you said, I believe too that this is probably something Pep wanted to do since the beginning of the season, but he never had all players available, until now. can you see Pep put this similar line up (3-5-2) in El Clasico, Euler? This is the key question, euler/ramzi/issiah had a really good discussion of it on twitter right after the game. To me I would be slightly worried about the matchup, mainly v Ronaldo. So if alves gets caught upfield it leaves ronaldo in space against someone (the question of who someone is will be addressed in a bit). While this is the case normally the 3-5-2 exacerbates it slightly. The other question is do we trust alexis to defend against RM? I personally do, considering that the defending would mostly take the form of tracking back and adding width to the backline and since I don’t particuraly view arebola as a threat (and he is most likely the rb). 2. mascherano: fast, amazing open field tackler, did struggle in a 3 man back line against valencia though. 3. puyol: seems to have lost a step but its puyol, hes our captain and our leader. I side with pique and mascherano, while puyols leadership is important this formation runs a high likelihood of isolating the rcb on ronaldo, and there is no one in the world I would trust more than masch in said situation. 1. Considering aerial threats from crosses and set pieces, I’d go for Puyol. 2. Don’t forget it’s the Bernabeu. And no one knows it better than our Captain. 3. Which brings me down to the leadership. The team plays better with Puyol on the pitch. Works as a motivational factor. 4. Puyol is a source of goal from corners. 5. Puyol-Pique is a proven pair. Sure Mascherano is more fit and tackles more effectively these days. He has given a tremendous service, earned numerous praises and respect. But do we want to see a mistimed sliding tackle leading to a goal? Look back at the 1st goal that Bilbao scored. The worst part about that was Masches’ decision making regarding risk vs reward. He slipped first on the slippery turf (an omen) and then abruptly tried to slide tackle out his way (ignored the omen!) to safety which totally backfired and was painful to see. His positional awareness and ball distribution has increased a lot, i must admit. Which makes him a close contender for the starting spot, at least. But now, thanks to Pique, Both Puyol and Masch might end up starting! Porque Pique!!!! I would chose Puyol-Pique too, for some reasons including yours, lyd. we need The Captain Lion Heart, imo. however, if Pique can’t play thanks to his idiocy, i think it will be Puyol-Mascherano IF both available. but that leave us to another question, we don’t have a big and tall defender to defend aerial threat (crosses and set pieces). yikes. just thought of another option, what if we play mascherano at dm, it does sacrifice busquets, but he has been unimpressive this year and it puts our 4 best ball winners together. Hate to admit this, but I’m really frightened at the thoughts of conceding corners against EE. Against EE, earlier at the super copa, in both legs i think, we were terrible defending corners. Each time a man (read Benzema)would be left unmarked at the far edge of the penalty box. No attempts were taken to solve that problem in those games. Keeping in mind that was the pre-season, but I’ve seen us defending later in similar fashion, leaving a free man in the box. With free kicks, we can rely on VV and our defenders who can outfox their petty runs. But huge problems lies in corner defending where we turn frogs and they turn hedgehogs. They whip, we hop! Scary! And VV, should stay full focused unlike at the Getafe. Im sure he will. Damn I referred to Getafe again.. I must stop here. That “stupid, boring corner” thing is something that Valdes should remember as well, I’d say. Don’t forget that he lazied that ball out rather than running it down and passing it along. gr8 analysis ,i don’t think many people give guardiola his due credit as a tactician.i think he is wary of the fact that other teams like u say are trying to find ways to defeat his team and has thus gone for a plan B and C,it will be very exciting to see how both teams will match up in el clasico and the technique RM will employ against FCB.Most fans I’ve spoken to thinks that RM would be victorious based on the form they show presently.However,i think FCB will surprise again and come away with the victory,thus leaving RM frustrated to again lose to seville the following week. Especially ’cause I’m perusing my favorite winter reading: Russian novels! (They’re a sight easier on the eyes if you skip all the ‘ode to the potato field’ and ‘philosophical discussion with the Orthodox priest’ and whatnot.) Also reminded me of lovely French film “The Hedgehog”, in which a debonair Japanese recognizes his doorwoman as a soulmate when she quotes Tolstoy: “Happy families are all alike; every unhappy family is unhappy in its own way”. I would say that unhappy teams tend to be more similar than different, while it’s thrilling to watch Barcelona find happiness in its variety. To bring Euler’s review in touch with Kari’s post, the familiarity of Barcelona is heartening as well. Note the tension in Euler’s first photograph. Then the explosion — of relief, to be sure, but also of joy — upon Alexis’ first goal. I am always a steadfast supporter of Dani Alves; I don’t care if he kicks the ball into the Rambles. He scooped up Alexis in a big warm hug from your brudder, and then he passed on a clear shot on goal to give Villa an open net and his due as the Barcelona striker. He’s got heart, and a big heart. Absolutely right about Alves. The man is the true definition of a team player. Rarely ever looks to shoot even when through on goal, always looking to provide and support. Throw in his ability to seemingly be able to press and run forever and that’s one special, special player. Not enough has been made of Alves assist to Villa IMO. That was incredibly generous and team first minded. Easy to take for granted, but you won’t see that often elsewhere. Villa needed that lift, he looked more energized and threatening than he has in a while (some to do with the freeing up as Euler outlined). Alves gave him that chance. You could see Villa’s appreciation in the acknowledgment and embrace in the celebration. That could be huge, and a turning point. The crowd getting behind Villa too, very nice to see. THIS. I logged in to post about this. Alves’ pass made me all warm and fuzzy inside. It’s things like these that make you really love and admire the “team-first” attitude that Barcelona has. I can’t think of any other truly dominant team, in any other sport, that puts the team first. Perhaps the easiest of the 4 goals but by far the most important for the remainder of the season ahead. I kept rewinding it and each time I could not believe he opted to pass to Villa. I, and most others, would have gone gung-ho on goal with that sort of space/distance from goal. Alves is a KING. With that said, there are times when he SHOULD shoot but still opts to cut it back for Messi, who is so tightly marked in the box that these passes don’t often get through. Okay enough with the Alves love but one more thing: I’ve always said that if there was one person on the team I would love to “hang” out with it would be Alves. He looks like he’s always enjoying himself. So fascinating to learn, I’ve always wondered what exactly was the system that helped Maradonna excel. Not it’s easy to see why, the width provided by that system was probably the pedestal he needed to show his talents. It seems that he’s being more effective this season than last one. Less start-ups, one goal every 169 minutes to 1 goal every 185 minutes in last season and so on. i believe it’s worth to check it out. Sport has issued a supposedly new strategy, playing a 3-5-2 system, playing with this eleven against EE: VV – Puyol, Masche, Abidal – Busquets, Keita – Alves(as carrilero, keeping Marcelo in check), Xavi, Iniesta – Villa or Alexis or Pedro(to keep width on the left, Alves will provide it on the right) and Messi as a false 9. Power subs: Cesc (if we are trailing in the score), Pedro or Alexis or Villa (depending if we want more high pressing or more one on one capabilities or more threat in the penalty area), Thiago if we want to circule the ball. IMO I don’t think those numbers scream a more improved Villa by any means. They’re obviously selective stats chosen to show an improvement from the previous year. As they say, you really can use stats to prove just about anything. In any case, I hope he continues and improves on those numbers. A goal every 169 is a bit low for Spains all-time leading scorer no? I’m convinced we will see the 3-5-2 against Madrid. You Could easily place Keita in there since for me he has earned his place in the lineup over Busi for now.I would also like to see this lineup against Levante. probably the line up against Levante will be the final draft of the line up that Pep will play on classico. Levante game should be the last match for us to perfecting the tactics against EE. As I believe Pep give rest to majority of the regulars in BATE game. This is sounding more and more cliché, but brilliant review, Euler(pronounced [oi-ler], people)! 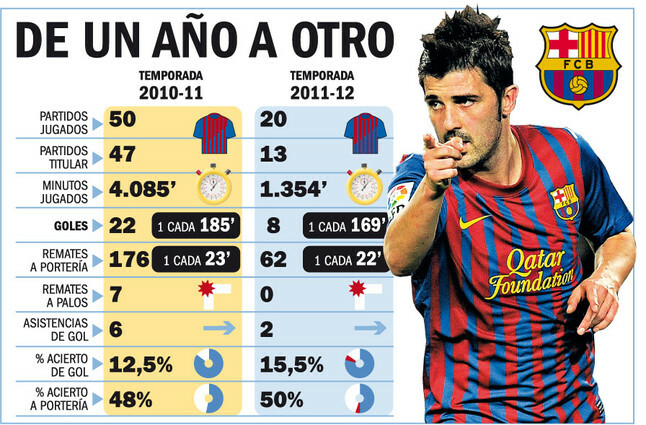 The press is still the less preferred choice by most teams playing Barça. The parked bus is more common, and still gives Barça problems. The commenter above mentioning Iniesta’s outside shots is on the right track; I do think we will see more outside shooting from those on the team who have a good chance of converting. And Pedro against Getafe also showed an important shift in bus-breaking strategy- if you get an opening, take the shot. Don’t try to to lay of that one last pass for the tap-in. Make the keeper work. The *best* bus-breaker, however, is in Iniesta’s diagonal off-ball runs from deep. He has converted several of these, accelerating on a diagonal from deep past two banks of defenders (involving at least four opponents [2 mids and the 2 centerbacks) who have to make quick decisions on who’s to mark him. The confusion he creates is enough to gain him a little space; his teammates have the vision and touch to weight their passes to him; and he has the touch to convert past the last defenders and keeper. He makes his cut from the left; I’d like to see othter players trying this from the right- perhaps Thiago. MADRID PLAYERS DID NOT GET AN EXTRA SUSPENSION IN CHAMPIONS LEAGUE!!!! MADRID PRESS ASKING FOR PIQUE TO GET AN EXTRA GAME BAN IN THE NAME OF “EQUAL” PUNISHMENT BY SAYING THEY GOT PUNSHED WHEN THEY DID IT, WHILE CONCEALING IT WAS ONLY A FINE, IS PURE MANIPULATION! NOW THEY’RE CLAIMING THAT IF PIQUE DOESN’T GET PUNISHED THAT WOULD BE THE ULTIMATE PROOF OF VILLARATO, WHICH PUTS THEM IN A WIN WIN SITUATION! lol, you’re talking about Evil’s press. Is it you Greece Barca? I just lost my temper a “tiny” bit not so much ’cause Pique might lose el classico but mostly because I find this manipulative behavior so appauling it makes me sick. I’m not talking just in sports journos but in politics, economy,justice system and of course in politcal journalism as well were consequences of this type of behavior are of course much more dire, Greece being one of the many countries suffering because of this “selective memory” and manipulation of opinions by those with access to the media. You are the maestro brother. Any people from Oz know if there is a penya or something down in Melbourne? I am searching for one currently! Judging from the bottom paragraph of this report, there appears to be an active Melbourne fanbase too! I didn’t see this match, saw have no idea of how the formation changed through the course of it. But it looks like the majority here have started to believe that the 3-5-2 formation is going to be the best. How much could we judge a system on the basis of a victory against rayo Valecano? 3-5-2 may sound great but the biggest problem for us at bernebeu will be the players of the opposition. With two ultra pacy wingers(Ronaldo and Di Maria), a system which works really well in counter attacking and with some one like Ozil in the middle; I would say that is the last place to go and play 3-5-2. Against Rayo Valecano at Camp Nou it may have worked wonders, but at Bernebeu I think we would be massacred with such a system. May be I am just concentrating more on opposition’s strengths rather than ours, but everyone tend to forget that it’s a must win for us. Also we should remember how we struggled in AC Milan, when Boateng and Aquilani started to play on the wings, even though that was a 3-4-3. Also should remmeber the players RM got can beat those guys even in their sleep. Playing 3-5-2 at Bernebeu may be a brave decision. But there is only a very thin line which seperates that brave decision from being a reckless decidion. I’d be playing 5 down the back against the likes of Higuain, Di Maria, Ronaldo, Benzema, Oezil, Callejon, Kaka et al. And I’m betting that Sahin will play as the unknown entity. He’s being trained to play the Trojan Horse. Just Wow!!! That is an unbelievable analysis of the match. Alexis owned the left of the pitch. The dude was unbelievable. People will leave Messi alone now. It was unbelievable how cool the forward line looked with Messi on the right, Villa in the middle and Alexis on the left. Barca utilizing a 3-5-2 was very interesting. And particularly with Sport now reporting they may use it in the Clasico this formation is going to get significant attention. But that’s not what’s most important about what Pep did in the Rayo match. And I hope that came across in this review. Any team can in theory play 3 different formations in one game. Teams frequently play two. But almost always to change shape you have to substitute players. And that’s the problem with trying to change shape. Doing so – you utilize the substitutions you can make and lose players. In turn, the opposition manager can then make substitutions in response that you may not be able to counter because you’ve used your substitutions already and can’t bring players back on the pitch. That’s part of why it’s such a major risk to change shape in games – especially if it’s a major change in shape like going from a 4-3-3 to a 3-5-2. However, if you can dynamically morph from that initial 4-3-3 into a 3-5-2 without taking any players off or needing to add players – that changes the risk-reward equation. That greatly increases your flexibility. What was so interesting about the Rayo match and why I wanted to focus on analyzing it in detail is that it’s signal for where Pep wants to go. It makes the logic of his experimentation this season more apparent. If he can dynamically change shape without bringing on new players and the only way the opposition can respond to that new shape is to bring players on – then he’s won a huge tactical battle. He can almost always force the issue and define the shape of the match. I’m not sure what we’ll see in the Clasico. But it wouldn’t surprise me to see the team set up in different shapes at different times like they did against Rayo. Very interesting. He could force the substitution and then return to the original shape thereby rendering the substitution counterproductive. Could you give us a concrete example of how this could work against say…..EE? He could force the substitution and then return to the original shape thereby rendering the substitution counterproductive. Here’s a way of looking at it. For a manager every substitution has an opportunity cost to it. Each substitution means that you lose flexibility. Pep is dramatically increasing the opportunity cost of making substitutions for the opposition manager. Say with RM – they open with a midfield of Oezil/ Khedira/Alonso. Pep starts a 3-4-3 with messi also dropping in. RM would be at significant numerical disadvantage in midfield (though they would have numbers on the flanks). Mourinho could chose to go to a trivote – move oezil to the wing and bring in Diarra, just for example. Pep then switches to a 3-5-2 to spread the field. Those three defensive midfielders would be poorly suited to try to defend wide. I guess the match was perfect for tactical analysis, it must have been a lot of fun to write this review? So if we see the 3-5-2 in el Clasico, it has to be with Sanchez on the right wing, and he’ll have to have a hell of a match. The danger against Madrid is their super-fast wingers, and a Xabi Alonso who can play the long-range passes better than anybody else. Recently, I was not so convinced by the performances of Abidal and I have the feeling that he has lost some pace (although you write his pace was terrific this time). Abidal will be 33 next season, so I hope that we’ll buy a new defender in the summer. Jordi Alba, for instance. Or – if I’m allowed to dream – for the 3-5-2 Gareth Bale? He has incredible pace. Hopefully the transfers will be focused on the defense next year, the offense is almost perfection (and has enough depth). And he was like “Sure is Xingxian what’s up?” and then he took the ball and while screaming “I’m so pretty! I’M SO VERY PRETTY!” he whirled around like 360 degrees with the ball and then started the build-up to the 4th goal with a lateral cross-field pass. Caveat: I acknowledge due to memory decay it might not have actually happened like that (I don’t currently have a DVR) or even remotely like that. I hope to gain DVR capabilities so that I’ll be able to independently verify this sort of thing. Just like this identity which has all the important operations and constants, Euler’s review of this match summed up almost everything that happened.